Welcome to More Fit, a group fitness studio in Wixom, Michigan! We pride ourselves on offering a wide variety of cutting edge fitness classes led by talented instructors - and all at reasonable rates. Let us help you find the perfect FIT for your everyday workout routine! ​Time to celebrate! 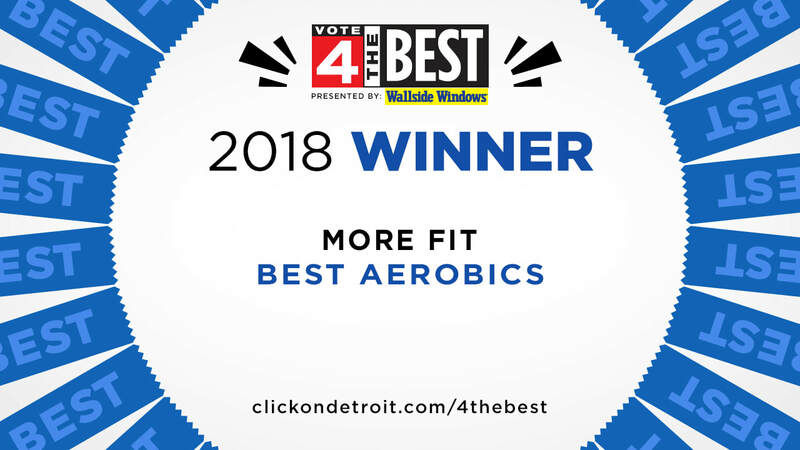 We are so excited to announce that More Fit was named the BEST Aerobics location in WDIV’s Vote 4 the Best contest! It is YOU, our More Fit family, that sets us apart and we are so very grateful for each and every one of you! THANK YOU! Whether you prefer to work out in the morning or evening, we have classes for you! Child care in our supervised playroom is offered at select classes. We’re proud to offer different class packages to best fit your schedule. Choose the one that works best for you, without any hidden costs! Our talented instructors are dedicated to helping you achieve your fitness goals. Meet the team that will help you find your fit!